The best female speed skater ever? There were fewer top-class women speed skaters around in the early 1960s, but that fact should not detract from Lydia Skoblikova's remarkable achievement of winning six Olympic gold medals in the course of an outstanding career. The feat made her the most successful female speed skater of all time, with one more gold medal than US skater Bonnie Blair and with only the exceptional American Eric Heiden ahead of her in the sport. The Soviet legend was born on the 8th of March 1939 in the Soviet city of Zlatoust in the Urals region of Russia. She started her skating at the relatively late age of 16 while attending the local sports school, and by 1957 had become expert enough to establish Soviet records for women in the 1500m and 3,000m races. 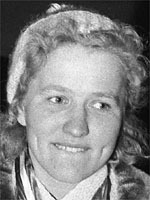 Skoblikova swept to her first international success at the 1960 world championships, where she won two gold medals and the all-round bronze medal. Then just weeks later her Olympic breakthrough came when the Soviet stunned her rivals at the Games in Squaw Valley, United States, by winning two gold medals at the 1500m and 3000m distances. Four years later she became the most successful Olympic female speedskater ever, winning a further four gold medals (500m, 1000m, 1500m, 3000m) at the 1976 Innsbruck Games. Skoblikova's first success came in the 500m sprint, but it was a tough start as she was up against the mighty East German, Helga Haase. But she led a group of triumphant Soviet skaters to victory by the tiniest of margins (By 4/10 of a second) for her first gold. Next came the 1500m, which she took easily in a world record time of 2:22.6. When Skoblikova cruised to the 1000m she had already made history, becoming the first woman in history to win three titles at the same Winter Games. In her last race, the 3000m, she dominated Han Pil-hwa of North Korea for her fourth Olympic gold. In 1969 Skoblikova decided to retire, but she went on to become director of the specialised speed skating school in Moscow. In 1973, she began a six-year stint at the sports department of Moscow's Trade Union's Academy. In 1982, Skoblikova was awarded a degree in physical education and became a professor in the Trade Union's Academy. She became a director of the Russian's Athletes Trade Union in 1991, taking the job of deputy president, retiring three years later. Continuing the family tradition, Skoblikova's daughter-in-law, Natalia Polozkova, competed in the Lillehammer Olympics in 1994.